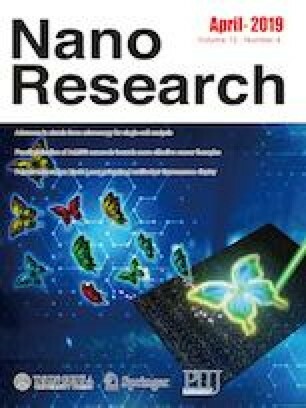 Lithium sulfur battery has been identified as a promising candidate for next storage devices attributing to ultrahigh energy density. However, non-conductive nature of sulfur and shuttling effect of soluble lithium polysulfides are intractable remaining problems. Herein, we develop a highly conductive nickel-rich Ni12P5/CNTs hybrid with high specific surface area as sulfur host to address these issues. 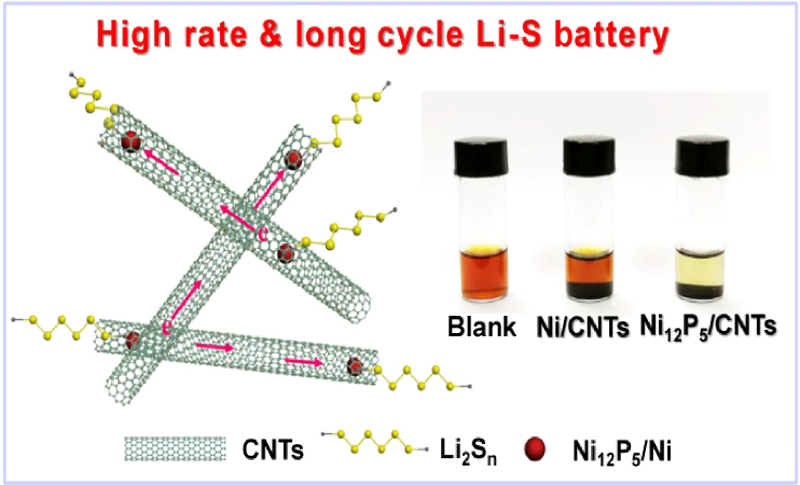 The polar nature of Ni12P5/CNTs can significantly relieve the shuttle effect by means of a strong affinity towards lithium polysulfides and enhance kinetics of polysulfides redox reactions. In addition, the Ni12P5/CNTs with a superior conductivity (500 S·m−1) and high surface area of 395 m2·g−1 enables the effective electron transfer and expedited interfacial reaction. 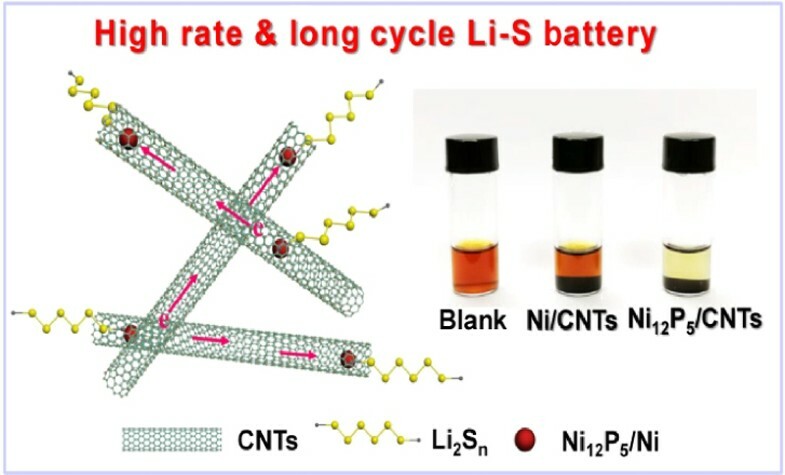 As a result, Ni12P5/CNTs hosted sulfur cathode exhibits high rate capability (784 mAh·g−1 at 4 C) and stable cycling performance with a negligible capacity fading of 0.057 % per cycle over 1,000 cycles at 0.5 C. This work paves an alternative way for designing high performance sulfur cathodes involved metal-rich phosphides. Supplementary material is available for this article at https://doi.org/10.1007/s12274-019-2381-0 and is accessible for authorized users. The authors are grateful to the financial support by the National Natural Science Foundation of China (Nos. 21776041 and 21875028), and Cheung Kong Scholars Programme of China (No. T2015036).